108:0.1 THE MISSION OF the Thought Adjusters to the human races is to represent, to be, the Universal Father to the mortal creatures of time and space; that is the fundamental work of the divine gifts. Their mission is also that of elevating the mortal minds and of translating the immortal souls of men up to the divine heights and spiritual levels of Paradise perfection. And in the experience of thus transforming the human nature of the temporal creature into the divine nature of the eternal finaliter, the Adjusters bring into existence a unique type of being, a being consisting in the eternal union of the perfect Adjuster and the perfected creature which it would be impossible to duplicate by any other universe technique. 108:0.2 Nothing in the entire universe can substitute for the fact of experience on nonexistential levels. The infinite God is, as always, replete and complete, infinitely inclusive of all things except evil and creature experience. God cannot do wrong; he is infallible. God cannot experientially know what he has never personally experienced; God’s preknowledge is existential. Therefore does the spirit of the Father descend from Paradise to participate with finite mortals in every bona fide experience of the ascending career; it is only by such a method that the existential God could become in truth and in fact man’s experiential Father. The infinity of the eternal God encompasses the potential for finite experience, which indeed becomes actual in the ministry of the Adjuster fragments that actually share the life vicissitude experiences of human beings. 108:1.1 When Adjusters are dispatched for mortal service from Divinington, they are identical in the endowment of existential divinity, but they vary in experiential qualities proportional to previous contact in and with evolutionary creatures. We cannot explain the basis of Adjuster assignment, but we conjecture that these divine gifts are bestowed in accordance with some wise and efficient policy of eternal fitness of adaptation to the indwelt personality. We do observe that the more experienced Adjuster is often the indweller of the higher type of human mind; human inheritance must therefore be a considerable factor in determining selection and assignment. 108:1.2 Although we do not definitely know, we firmly believe that all Thought Adjusters are volunteers. But before ever they volunteer, they are in possession of full data respecting the candidate for indwelling. The seraphic drafts of ancestry and projected patterns of life conduct are transmitted via Paradise to the reserve corps of Adjusters on Divinington by the reflectivity technique extending inward from the capitals of the local universes to the headquarters of the superuniverses. This forecast covers not only the hereditary antecedents of the mortal candidate but also the estimate of probable intellectual endowment and spiritual capacity. The Adjusters thus volunteer to indwell minds of whose intimate natures they have been fully apprised. 1. Intellectual capacity. Is the mind normal? What is the intellectual potential, the intelligence capacity? Can the individual develop into a bona fide will creature? Will wisdom have an opportunity to function? 2. Spiritual perception. The prospects of reverential development, the birth and growth of the religious nature. What is the potential of soul, the probable spiritual capacity of receptivity? 3. Combined intellectual and spiritual powers. The degree to which these two endowments may possibly be associated, combined, so as to produce strength of human character and contribute to the certain evolution of an immortal soul of survival value. 108:1.8 The short time intervening between the volunteering and the actual dispatch of the Adjuster is presumably spent in the Divinington schools of the Personalized Monitors where a working pattern of the waiting mortal mind is utilized in instructing the assigned Adjuster as to the most effective plans for personality approach and mind spiritization. This mind model is formulated through a combination of data supplied by the superuniverse reflectivity service. At least this is our understanding, a belief which we hold as the result of putting together information secured by contact with many Personalized Adjusters throughout the long universe careers of the Solitary Messengers. 108:1.9 When once the Adjusters are actually dispatched from Divinington, practically no time intervenes between that moment and the hour of their appearance in the minds of their chosen subjects. The average transit time of an Adjuster from Divinington to Urantia is 117 hours, 42 minutes, and 7 seconds. Virtually all of this time is occupied with registration on Uversa. 108:2.1 Though the Adjusters volunteer for service as soon as the personality forecasts have been relayed to Divinington, they are not actually assigned until the human subjects make their first moral personality decision. The first moral choice of the human child is automatically indicated in the seventh mind-adjutant and registers instantly, by way of the local universe Creative Spirit, over the universal mind-gravity circuit of the Conjoint Actor in the presence of the Master Spirit of superuniverse jurisdiction, who forthwith dispatches this intelligence to Divinington. Adjusters reach their human subjects on Urantia, on the average, just prior to the sixth birthday. In the present generation it is running five years, ten months, and four days; that is, on the 2,134th day of terrestrial life. 108:2.2 The Adjusters cannot invade the mortal mind until it has been duly prepared by the indwelling ministry of the adjutant mind-spirits and encircuited in the Holy Spirit. And it requires the co-ordinate function of all seven adjutants to thus qualify the human mind for the reception of an Adjuster. Creature mind must exhibit the worship outreach and indicate wisdom function by exhibiting the ability to choose between the emerging values of good and evil—moral choice. 108:2.3 Thus is the stage of the human mind set for the reception of Adjusters, but as a general rule they do not immediately appear to indwell such minds except on those worlds where the Spirit of Truth is functioning as a spiritual co-ordinator of these different spirit ministries. If this spirit of the bestowal Sons is present, the Adjusters unfailingly come the instant the seventh adjutant mind-spirit begins to function and signalizes to the Universe Mother Spirit that it has achieved in potential the co-ordination of the associated six adjutants of prior ministry to such a mortal intellect. Therefore have the divine Adjusters been universally bestowed upon all normal minds of moral status on Urantia ever since the day of Pentecost. 108:2.4 Even with a Spirit of Truth endowed mind, the Adjusters cannot arbitrarily invade the mortal intellect prior to the appearance of moral decision. But when such a moral decision has been made, this spirit helper assumes jurisdiction direct from Divinington. There are no intermediaries or other intervening authorities or powers functioning between the divine Adjusters and their human subjects; God and man are directly related. 1. The assignment of personal seraphic guardians. If a mortal has not been previously indwelt by an Adjuster, the assignment of a personal guardian brings the Adjuster forthwith. There exists some very definite but unknown relation between the ministry of Adjusters and the ministry of personal seraphic guardians. 2. The attainment of the third circle of intellectual achievement and spiritual attainment. I have observed Adjusters arrive in mortal minds upon the conquest of the third circle even before such an accomplishment could be signalized to the local universe personalities concerned with such matters. 3. Upon the making of a supreme decision of unusual spiritual import. Such human behavior in a personal planetary crisis usually is attended by the immediate arrival of the waiting Adjuster. 4. The spirit of brotherhood. Regardless of the attainment of the psychic circles and the assignment of personal guardians—in the absence of anything resembling a crisis decision—when an evolving mortal becomes dominated by the love of his fellows and consecrated to unselfish ministry to his brethren in the flesh, the waiting Adjuster unvaryingly descends to indwell the mind of such a mortal minister. 5. Declaration of intention to do the will of God. We observe that many mortals on the worlds of space may be apparently in readiness to receive Adjusters, and yet the Monitors do not appear. We go on watching such creatures as they live from day to day, and presently they quietly, almost unconsciously, arrive at the decision to begin the pursuit of the doing of the will of the Father in heaven. And then we observe the immediate dispatch of the Thought Adjusters. 6. Influence of the Supreme Being. On worlds where the Adjusters do not fuse with the evolving souls of the mortal inhabitants, we observe Adjusters sometimes bestowed in response to influences which are wholly beyond our comprehension. We conjecture that such bestowals are determined by some cosmic reflex action originating in the Supreme Being. As to why these Adjusters can not or do not fuse with these certain types of evolving mortal minds we do not know. Such transactions have never been revealed to us. 108:3.1 As far as we know, Adjusters are organized as an independent working unit in the universe of universes and are apparently administered directly from Divinington. They are uniform throughout the seven superuniverses, all local universes being served by identical types of Mystery Monitors. We do know from observation that there are numerous series of Adjusters involving a serial organization that extends through races, over dispensations, and to worlds, systems, and universes. It is, however, exceedingly difficult to keep track of these divine gifts since they function interchangeably throughout the grand universe. 108:3.2 Adjusters are of complete record (outside of Divinington) only on the headquarters of the seven superuniverses. The number and order of each Adjuster indwelling each ascending creature are reported out by the Paradise authorities to the headquarters of the superuniverse, and from there are communicated to the headquarters of the local universe concerned and relayed to the particular planet involved. But the local universe records do not disclose the full number of the Thought Adjusters; the Nebadon records contain only the local universe assignment number as designated by the representatives of the Ancients of Days. The real significance of the Adjuster’s complete number is known only on Divinington. 108:3.3 Human subjects are often known by the numbers of their Adjusters; mortals do not receive real universe names until after Adjuster fusion, which union is signalized by the bestowal of the new name upon the new creature by the destiny guardian. 108:3.4 Though we have the records of Thought Adjusters in Orvonton, and though we have absolutely no authority over them or administrative connection with them, we firmly believe that there is a very close administrative connection between the individual worlds of the local universes and the central lodgment of the divine gifts on Divinington. We do know that, following the appearance of a Paradise bestowal Son, an evolutionary world has a Personalized Adjuster assigned to it as the planetary supervisor of Adjusters. 108:3.7 As a result of many suggestive lines of evidence, we believe that the Adjusters are thoroughly organized, that there exists a profoundly intelligent and efficient directive administration of these divine gifts from some far-distant and central source, probably Divinington. We know that they come from Divinington to the worlds, and undoubtedly they return thereto upon the deaths of their subjects. 108:3.8 Among the higher spirit orders it is exceedingly difficult to discover the mechanisms of administration. My order of personalities, while engaged in the prosecution of our specific duties, is undoubtedly unconsciously participating with numerous other personal and impersonal sub-Deity groups who unitedly are functioning as far- flung universe correlators. We suspect that we are thus serving because we are the only group of personalized creatures (aside from Personalized Adjusters) who are uniformly conscious of the presence of numerous orders of the prepersonal entities. 108:3.9 We are aware of the presence of the Adjusters, who are fragments of the prepersonal Deity of the First Source and Center. We sense the presence of the Inspired Trinity Spirits, who are superpersonal expressions of the Paradise Trinity. We likewise unfailingly detect the spirit presence of certain unrevealed orders springing from the Eternal Son and the Infinite Spirit. And we are not wholly unresponsive to still other entities unrevealed to you. 108:3.10 The Melchizedeks of Nebadon teach that the Solitary Messengers are the personality co-ordinators of these various influences as they register in the expanding Deity of the evolutionary Supreme Being. It is very possible that we may be participants in the experiential unification of many of the unexplained phenomena of time, but we are not consciously certain of thus functioning. 108:4.1 Apart from possible co-ordination with other Deity fragments, the Adjusters are quite alone in their sphere of activity in the mortal mind. The Mystery Monitors eloquently bespeak the fact that, though the Father may have apparently resigned the exercise of all direct personal power and authority throughout the grand universe, notwithstanding this act of abnegation in behalf of the Supreme Creator children of the Paradise Deities, the Father has certainly reserved to himself the unchallengeable right to be present in the minds and souls of his evolving creatures to the end that he may so act as to draw all creature creation to himself, co-ordinately with the spiritual gravity of the Paradise Sons. Said your Paradise bestowal Son when yet on Urantia, “I, if I am lifted up, will draw all men.” This spiritual drawing power of the Paradise Sons and their creative associates we recognize and understand, but we do not so fully comprehend the methods of the all-wise Father’s functioning in and through these Mystery Monitors that live and work so valiantly within the human mind. 108:4.2 While not subordinate to, co-ordinate with, or apparently related to, the work of the universe of universes, though acting independently in the minds of the children of men, unceasingly do these mysterious presences urge the creatures of their indwelling toward divine ideals, always luring them upward toward the purposes and aims of a future and better life. These Mystery Monitors are continually assisting in the establishment of the spiritual dominion of Michael throughout the universe of Nebadon while mysteriously contributing to the stabilization of the sovereignty of the Ancients of Days in Orvonton. 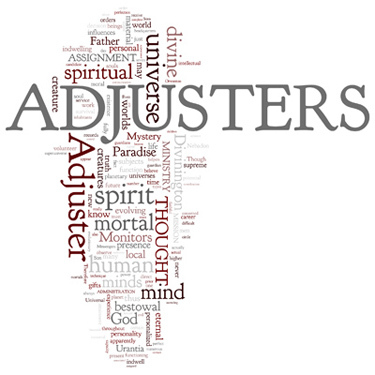 The Adjusters are the will of God, and since the Supreme Creator children of God also personally embody that same will, it is inevitable that the actions of Adjusters and the sovereignty of the universe rulers should be mutually interdependent. Though apparently unconnected, the Father presence of the Adjusters and the Father sovereignty of Michael of Nebadon must be diverse manifestations of the same divinity. 108:4.3 Thought Adjusters appear to come and go quite independent of any and all other spiritual presences; they seem to function in accordance with universe laws quite apart from those which govern and control the performances of all other spirit influences. But regardless of such apparent independence, long-range observation unquestionably discloses that they function in the human mind in perfect synchrony and co-ordination with all other spirit ministries, including adjutant mind-spirits, Holy Spirit, Spirit of Truth, and other influences. 108:4.4 When a world is isolated by rebellion, when a planet is cut off from all outside encircuited communication, as was Urantia after the Caligastia upheaval, aside from personal messengers there remains but one possibility of direct interplanetary or universe communication, and that is through the liaison of the Adjusters of the spheres. No matter what happens on a world or in a universe, the Adjusters are never directly concerned. The isolation of a planet in no way affects the Adjusters and their ability to communicate with any part of the local universe, superuniverse, or the central universe. And this is the reason why contacts with the supreme and the self-acting Adjusters of the reserve corps of destiny are so frequently made on quarantined worlds. Recourse is had to such a technique as a means of circumventing the handicaps of planetary isolation. In recent years the archangels’ circuit has functioned on Urantia, but that means of communication is largely limited to the transactions of the archangel corps itself. 108:4.5 We are cognizant of many spirit phenomena in the far-flung universe which we are at a loss fully to understand. We are not yet masters of all that is transpiring about us; and I believe that much of this inscrutable work is wrought by the Gravity Messengers and certain types of Mystery Monitors. I do not believe that Adjusters are devoted solely to the remaking of mortal minds. I am persuaded that the Personalized Monitors and other orders of unrevealed prepersonal spirits are representative of the Universal Father’s direct and unexplained contact with the creatures of the realms. 108:5.2 What the Thought Adjuster cannot utilize in your present life, those truths which he cannot successfully transmit to the man of his betrothal, he will faithfully preserve for use in the next stage of existence, just as he now carries over from circle to circle those items which he fails to register in the experience of the human subject, owing to the creature’s inability, or failure, to give a sufficient degree of co-operation. 108:6.1 It is indeed a marvel of divine condescension for the exalted and perfect Adjusters to offer themselves for actual existence in the minds of material creatures, such as the mortals of Urantia, really to consummate a probationary union with the animal-origin beings of earth. 108:6.2 No matter what the previous status of the inhabitants of a world, subsequent to the bestowal of a divine Son and after the bestowal of the Spirit of Truth upon all humans, the Adjusters flock to such a world to indwell the minds of all normal will creatures. Following the completion of the mission of a Paradise bestowal Son, these Monitors truly become the “ kingdom of heaven within you.” Through the bestowal of the divine gifts the Father makes the closest possible approach to sin and evil, for it is literally true that the Adjuster must coexist in the mortal mind even in the very midst of human unrighteousness. The indwelling Adjusters are particularly tormented by those thoughts which are purely sordid and selfish; they are distressed by irreverence for that which is beautiful and divine, and they are virtually thwarted in their work by many of man’s foolish animal fears and childish anxieties. 108:6.3 The Mystery Monitors are undoubtedly the bestowal of the Universal Father, the reflection of the image of God abroad in the universe. A great teacher once admonished men that they should be renewed in the spirit of their minds; that they become new men who, like God, are created in righteousness and in the completion of truth. The Adjuster is the mark of divinity, the presence of God. The “image of God” does not refer to physical likeness nor to the circumscribed limitations of material creature endowment but rather to the gift of the spirit presence of the Universal Father in the supernal bestowal of the Thought Adjusters upon the humble creatures of the universes. 108:6.4 The Adjuster is the wellspring of spiritual attainment and the hope of divine character within you. He is the power, privilege, and the possibility of survival, which so fully and forever distinguishes you from mere animal creatures. He is the higher and truly internal spiritual stimulus of thought in contrast with the external and physical stimulus, which reaches the mind over the nerve-energy mechanism of the material body. 108:6.5 These faithful custodians of the future career unfailingly duplicate every mental creation with a spiritual counterpart; they are thus slowly and surely re-creating you as you really are (only spiritually) for resurrection on the survival worlds. And all of these exquisite spirit re-creations are being preserved in the emerging reality of your evolving and immortal soul, your morontia self. These realities are actually there, notwithstanding that the Adjuster is seldom able to exalt these duplicate creations sufficiently to exhibit them to the light of consciousness. 108:6.6 And as you are the human parent, so is the Adjuster the divine parent of the real you, your higher and advancing self, your better morontial and future spiritual self. And it is this evolving morontial soul that the judges and censors discern when they decree your survival and pass you upward to new worlds and never-ending existence in eternal liaison with your faithful partner—God, the Adjuster. 108:6.7 The Adjusters are the eternal ancestors, the divine originals, of your evolving immortal souls; they are the unceasing urge that leads man to attempt the mastery of the material and present existence in the light of the spiritual and future career. The Monitors are the prisoners of undying hope, the founts of everlasting progression. And how they do enjoy communicating with their subjects in more or less direct channels! How they rejoice when they can dispense with symbols and other methods of indirection and flash their messages straight to the intellects of their human partners! 108:6.8 You humans have begun an endless unfolding of an almost infinite panorama, a limitless expanding of never-ending, ever-widening spheres of opportunity for exhilarating service, matchless adventure, sublime uncertainty, and boundless attainment. When the clouds gather overhead, your faith should accept the fact of the presence of the indwelling Adjuster, and thus you should be able to look beyond the mists of mortal uncertainty into the clear shining of the sun of eternal righteousness on the beckoning heights of the mansion worlds of Satania.